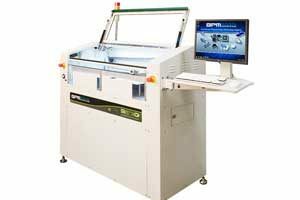 BPM Microsystems announced today their latest Automated Programming Systems (APS) — the 3910. Rated at 1,432 Devices per Hour (DPH), the 3910 is the fastest device programming system in its class and price range. By utilizing on-the-fly vision centering, the engineering team at BPM increased real production performance by roughly 70% compared to the 3900, while maintaining a mid-level price point in the APS market. 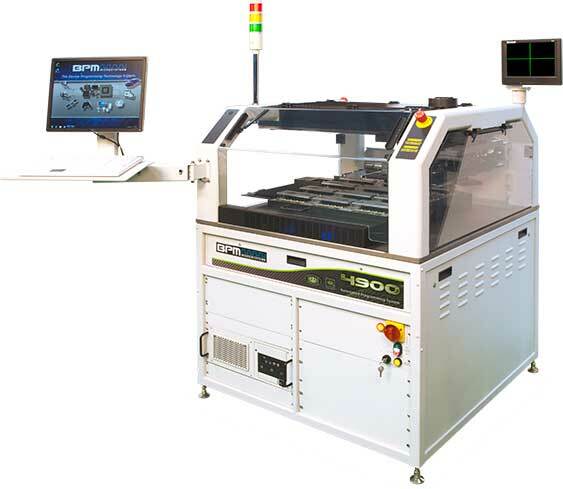 “The 3910 delivers the lowest total cost per device by combining high throughput, ease of use, fast setup, high yield and the flexibility to program virtually any device on a single platform. All this is backed up by the most powerful software in the industry and our award-winning customer service team,” said William White, founder and President of BPM Microsystems. “We have seen a lot of market excitement with the 3910 APS and we have already taken numerous orders,” said Colin Harper, Product Manager on the 3910. 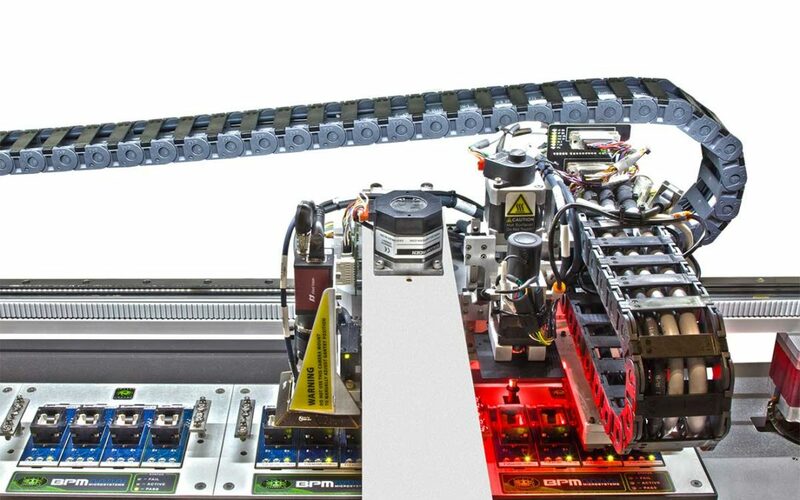 “By combining precision on-the-fly component alignment with optimized motion control, the 3910 is able to achieve real throughput previously only produced with the higher-priced systems. With reliable CSP support and high throughput, the new 3910 is truly in a class by itself,” says Harper. The 3910 offers WhisperTeach™, one of BPM’s award-winning exclusive features. WhisperTeach™ automatically teaches the critical Z-height with 15-micron accuracy for each pick/place location even for very small packages, saving an average of 83% of the time required for job setup and increasing yield. On-the-fly vision alignment is achieved with CyberOptics™, originally only available on their flagship product, the 4900. With full-time alignment, the new system can maintain maximum speeds without sacrificing precision. The 3910 has up to four 9th Generation high-speed universal programming sites, supporting up to 16 devices programmed simultaneously. Vector Engine with BitBlast, standard on all BPM’s 9th Gen systems, increases the throughput for high-density eMMC devices, compared to other systems. For example, on a 4GB Toshiba device, Vector Engine with BitBlast reduces program/verify time by over 8 minutes per device. In a direct comparison with one of BPM’s major competitors, that same device finished over 300 seconds faster on the 9th Gen programmer. BPM will continue to offer the 3900 as a less expensive alternative for customers who don’t require the increased throughput. HOUSTON, TX–(U.S. Tech)–Oct. 26, 2017– BPM Microsystems will demonstrate its new 4900 automated memory programming system at Productronica, scheduled to take place November 14 – 17, 2017 in Munich, Germany. The 4900, with its advanced chip-scale part (CSP) device handling, on-the-fly vision alignment, and HS400 programming speeds, satisfies a vast range of programming needs in one automated system. 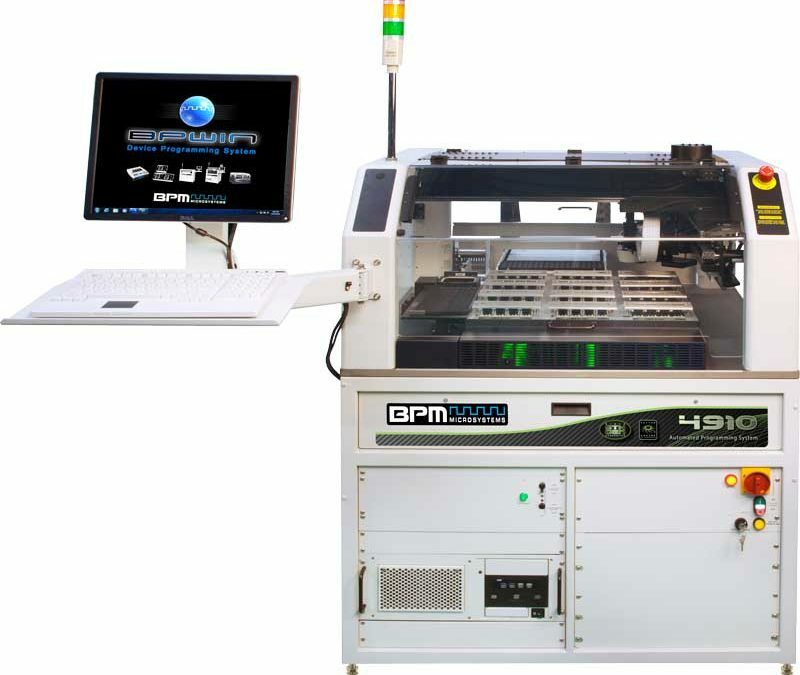 Featuring high-performance laser marking and 3D inspection, the 4900 provides advanced serialization and quality control, meeting the highest programming and cyber security standards for automotive, aerospace, medical, industrial and mobile device industries. The 4900 is powered by the newest BPM 9th generation technology. This technology programs eMMC in HS400 mode, the highest speed mode available, as well as HS200, DDR and SDR. The 4900 supports a high-mix of devices on the same site, including microcontrollers, FPGA, eMMC, NAND, NOR and Serial Flash, delivering speed and versatility on one system. Innovations for advanced CSP device handling include BPM patent-pending WhisperTeach™ technology, which fully automates teaching the smallest CSP devices. A new camera delivers vision alignment across the x, y, and z axes, to accurately align small devices while in motion. The new alignment and positioning capabilities of the 4900 allow it to operate at full speed when handling CSP devices. The 4900 introduces a new hybrid laser that combines fiber and Nd:YAG laser technologies for precision marking quality. Built-in mark verification and laser power monitoring at the point of mark ensure a consistent, damage-free mark on every device. The integrated 3D Inspection system completes the 4900 by delivering full device package validation after programming. The 3D Inspection checks BGA, CSP, QFP, TSOP, SOIC and J-Lead devices for coplanarity, bent lead, pitch, width, diameter, standoff and XY errors. 3D Inspection ensures each device meets specifications resulting in higher quality devices and lower overall costs.